Customers use rating and review Websites to research, ask questions and leave feedback about brands. The interactivity of the Web allows users to connect with companies, professionals and other consumers in a new way. Review and rating Websites are a prime example of how this interactivity can work for (and against) businesses. Reviews, ratings and social media content such as Videos, Photos are one of the quickly easiest ways to increase online purchases. 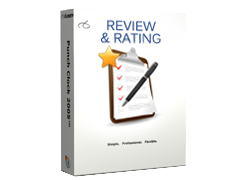 Reviews and Ratings solution has been designed seamlessly to integrate into your website, on any page. So for increase the numbers of sales on your website and drive traffic, Reviews and Ratings will help you a lot. KN Technologies can help your website or company to make the most rating and review for your Website. Contact us if want a free Social Media Marketing plan and don't hesitate to ask us how you can improve your search visibility with these Websites.